SWIG is pleased to again be supporting the apprentice competition to be held at WWEM on 21 November 2018 – we are proud to be encouraging the next generation of water engineers! This year’s Water Wastewater & Environmental Monitoring Conference will take place on 21st -22nd November 2018 and will see the return of the WWEM Instrumentation Apprentice Competition which is being organised by the Water Industry Process Automation & Control Group (WIPAC). This year’s competition will see Apprentices from both the Water Companies and the wider industry compete against each other over three tasks on 21st November to win the competition. The competition is being sponsored and supported this year by a number of Water Industry organisations including ABB, Analytical Technology (ATi), Partech, RS Hydro, Siemens, Siris, SWIG, Vega & WRc. 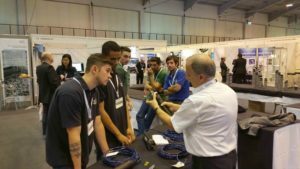 Also at this year’s WWEM will be the WIPAC Learning Zone which put Apprentices, Technicians and Engineers together with technical experts within the Industry supply chain to learn about different aspects of Instrumentation & Control. Throughout the two days of the WWEM Conference & Exhibition there will be a total of 40 free workshops where attendees can pre-register to attend hour long sessions to learn about the different aspects of instrumentation & control within the Water Industry. Those interested should contact olivergrievson@wipac.org.uk to register their interest to receive details as they are released and to receive priority booking for the sessions.